Every day that Bill visits our Rice-MacDonald vineyard in Fiddletown, he passes “his” 100 year old pear tree, left from an old homestead now long gone. He has claimed it as his tree, and comes home daily with the pears that have fallen on the ground. Marred fruit he leaves for the local deer families and perhaps the bear that has been getting into the vineyard again this year. These pears are not cultivated or tended to. The tree is not sprayed, treated for fire blight, pruned or watered. It survives on its own, with just the rain water nature provides, which some years is not much. We are not sure the variety. It looks like a Bartlett in shape but the coloring is more like a Bosc, and because it is fall ripening, I would lean towards the latter. My kitchen counter is filling up with bowls of the these old fashioned pears that are a beautilful yellow, tinged with brown. The flesh is crisp and sweet, with a perfect pear flavor. The visually lovely ones we eat in salads or as part of a cheese plate. The not so perfect ones get cut up into cakes, chutneys and sauces. Try my Fiddletown Pear Cake and you will know that Fall has arrived. Crisp on the top and soft spiced-pear cake underneath, its a total comfort dessert. This year my Black Jack fig tree is ripening at the same time as the pears – a little late this year being early October. 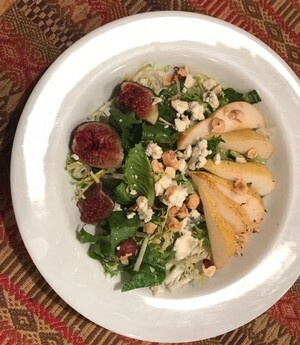 Last night we had the most delicious salad with the pears, figs, toasted hazelnuts, crumbled blue and mixed lettuces with a light walnut-balsamic vinaigrette. Every year I witness something special, something I have not seen or heard before from the barn owls on our ranch in Fiddletown. Catching these moments requires patience and involves sitting quietly near the owl boxes between 8:30 and 9:00 pm just as the sky is getting very dark. Ginger, our Aussie dog, always comes along and sometimes Bart the cat. They know the routine – sit and wait. This year we had 60 inches of rain in Fiddletown. The cover crop and the wild grass in alternate rows grew to 4 feet high and were so thick that you couldn’t see the earth below it. I knew that we had owls in all 4 boxes in two different vineyards, but I had not heard a lot of action in the nighttime – sounds of the owls hovering and swooping down for their prey. Even though the barn owl’s hearing is so sharp they can find a rodent without seeing it, I guessed that they were hunting in my neighbors’ fields where the grass was grazed down by horses and cattle. Last week our vineyards were finally dry enough to get a tractor in without sinking. Our vineyard dude, Rob, started mowing the rows and after a couple of days I heard the “air force” return over the DTR Ranch. 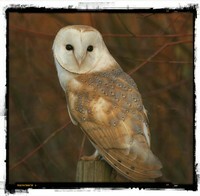 A couple of nights ago under a waxing moon, I wandered down to our main owl box to stand and listen for signs of life. This is the time of year when the young owls hatch, usually about 3. The eggs are fertilized over a ten-day period, so the eggs hatch at different times in the order they were fertilized. Just as the light was fading the box came alive. I heard a rumbling and feet shuffling in the box (the female owl), and then a very faint screech (one hatched owlet). Last night I checked again and was lucky to witness something new. The female owl in the box called out with a garbled sound, and then the male in the valley oak tree above the box answered with his loud screeching call. They called back and forth a few times. What were they saying? "Hey, I'm awake and I'm starving. I'm stuck in this box and I need some food." "Yeah, yeah, I'm on it." Then with one long screech he soared off over the vineyard to start the hunt. The female went quiet and I heard the single owlet, today with a stronger voice, asking for something to eat. The female barn owl will stay in the box until all the eggs are hatched, while the male hunts for her and the owlets. When all owlets are hatched they will share in the hunting. During the nesting period, they will need over 1,000 rodents. In order to live and breed over the course of a year, a pair of barn owls need to eat around 5,000 moles, gophers and field mice, protecting the vines from being destroyed. This year everything seems to be on a late schedule, including the barn owls, so check back for updates on my owlet count. Our organic vineyards in Fiddletown produce three wines that we are very proud of. 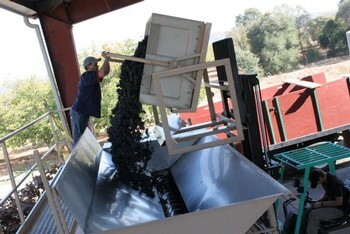 Farming organically is a labor of love that you can feel in the wines. 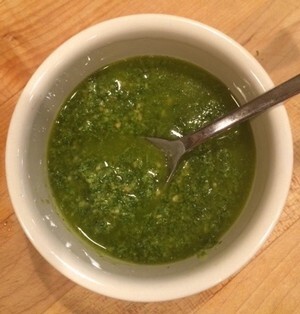 My love affair with pesto started in Nice in the 80’s, where it is called pistou. Bill and I were traveling on a wine discovery trip for his shop in Berkeley and dined at a tiny, whole-in-the-wall bistro called La Meranda. The husband, Jean Giusti, hailed from Genoa whose cooking is similar to Nicoise fare, by proximity and history. His wife Christiane came from northern France where butter is king, which you will see in a bit plays a role in my pistou story. The bistro is in the old part of Nice and is packed with diners every night, sitting on small stools, balancing menu chalkboards and glasses of wine. We ordered many dishes to share and the highlight was a simple pâtes au pistou, (pasta with pesto). The pasta was fresh from a shop in the Cours Saleya market area. The fragrant olive oil from Nice is mild and fruity, the best being Alziari. The basil is very sweet and bright green. Guisti always made a show of the mixing of the pâtes and the pistou in a large bowl, blending gently with two forks, getting the person who ordered it to help. The finishing touch is a large spoonful of sweet cream butter, tossed together until the noodles are coated. Gasp! Then he makes you take a bite in front of the entire room before it is served into a bowl and you think that you have died and gone to heaven. That is my touchstone pesto pasta. I have tried many times to recreate it here in California, coming close but not making it quite as good. The secret lies in three things: fruity fragrant olive oil, very young sweet basil, and fresh made pasta. You can add the butter or not. You can drizzle in a little cream if you wish, but let the pistou be the star, never mucking it up with other ingredients. There are many recipes for pesto on the Internet and in your favorite cookbooks, both French and Italian. Just stick with my rules above for fruityt olive oil and sweet basil. Please see my note below about pine nuts. There are also some decent store bought ones, and there are some store bought ones that are pretty bad. When buying pre-prepared pesto, look at the ingredients. Don’t buy ones with lots of cheese additives, gum, and other stabilizers. Buy one that looks like you made it, with plenty of olive oil. Most of the good ones I have found are in the refrigerated cases. Now that you have your pesto here are 4 Things to Do With Pesto That Don’t Require a Recipe. 1. This one is great for a quick appetizer, when friends pop over spontaneously. I have served cheese this way in our tasting room for years, and guests always think I am a genius. I’m not, but it is a good trick. Chose your cheese: a wedge of brie, a log of goat cheese, or a block of cream cheese. Place the cheese on a decorative plate or press the goat or cream cheese into a shallow bowl. Spread a good amount of pesto on top, about ½” thick. Chop up some pistachios, almonds, or walnuts and sprinkle on top. Serve with crackers or baguette slices. Option 2 : Add some slivered sun-dried tomatoes on top of the pesto. 2 & 3. These two are great for a warm night after work and fast to make. Pair up with something simple off the grill. Cut off the ends of the green beans and rinse them well. Grab a pan wide enough to let the beans stretch out and about 3-4 inches deep. Fill the pan about 2 inches deep with water and bring to a boil. Place the beans in the water and simmer until just tender, about 8 minutes. Keep checking a bean so that you don’t over cook them. Drain the beans in a colander. Let cool 5 minutes. Place the beans in a serving bowl. Toss with about 1 Tbl. pesto and the juice of ½ a lemon. Serve warm or at room temperature. 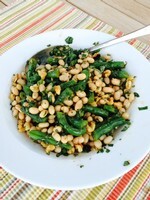 Take a can of great northern or cannellini beans, drain and rinse them. Place in a mixing bowl. Take a large, sweet tomato and cut it into ½ inch dice. Add to the beans. Take a handful of basil leaves and slice them across the leaves into narrow ribbons. Add to bowl. Start with about 2 Tbl. pesto and 1 tsp. balsamic vinegar. Add to the beans and toss to coat. Taste. You can add other things if you wish like, minced red onion, celery, or diced sweet peppers – basically what you have on hand. 4. Everyone loves this simple chicken off the grill. I like to use boneless thighs for this. Boneless breasts work also, but put them between plastic wrap and pound them until they are about 3/4” thick. Place 8 chicken thighs or 4 breasts in a large bowl. Add salt and pepper if you wish. Toss the chicken until well coated. Add more pesto if needed. Let sit at room temperature for 30 minutes. Grill over a medium fire. 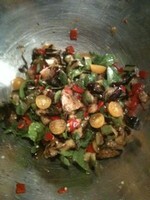 Serve with a big green salad, one of the side dishes above or some sliced garden tomatoes. Throw together something like I did last night from what I had available. Pasta with pesto, topped with a green bean, white bean and orange pepper mixta. Add a little cheese and Voila! Pine nuts are a basic ingredient of pesto. Tradionally they came from Italy and the US. 99% of the pine nuts sold here now are not from the US. They come from China, Korea, Russia and Vietnam. Unfortunately they sometimes mix varieties of pine nuts, some of which are inedible for human consumption. The result can give you what is called is called pine nut mouth or pine nut syndrome. It’s hypothesized that the particular species of pine responsible for this is the Pinus armandii in China. A friend of ours was hit with this for several weeks. The malady causes everything you eat to taste metallic and bitter, and makes you not to want to eat or drink. It can last days or weeks. I have stopped using pine nuts in all my cooking and try to avoid them when I eat out. For pesto, I use almonds. Walnuts are also good but a little more bitter. Pistachios are a nice alternative. There are California, Nevada and New Mexican pine nuts available online, which are in the shell or shelled and expensive. Pine nuts are very time consuming to harvest and shell, which is why they cost a lot. Here are some links to buy some this fall (the 2015 crop is sold out): Have a piñon shelling party and taste the real thing. 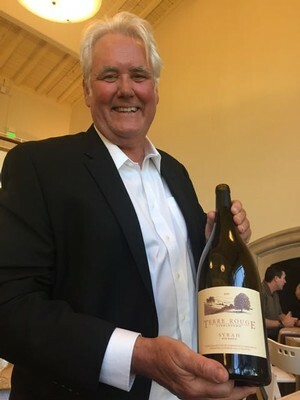 Last weekend in San Francisco, the Rhône Rangers gave Bill this coveted title. Bill is only the fourth to receive this great honor. Bill jokingly calls this the award for "perserverance" by working with Rhône varietals since the mid 80's. Bill's love affair with these grapes goes back to the 70's when he had his wine shop, Solano Cellars, in Berkeley, CA. After traveling the Rhône, meeting winemakers and studying the climate, he decided that the Sierra Foothills was the best terroir for his project, Terre Rouge. The first vintage of Terre Rouge in 1987 was a blend of grenache, mourvedre and syrah that was simply called Terre Rouge Reserve Red. In the 80's and early 90's, Americans were very unaware of Rhône varietals and were confused by blends in general. There were only a few vineyards to work with, so Bill convinced friends to plant what he wanted, and we started our own estate vineyards in Fiddletown. This is where the perserverance comes in and today we make almost 20 wines under the Terre Rouge label, blends and single varietal wines from specific vineyard sites up to 3200' in elevation. This week I made chicken and andouille sausage gumbo for the winery crew. This has become a tradition during harvest when the guys are working very long hours, especially this year as the harvest is compacted into fewer weeks. I make the gumbo the day before, then take it to the winery and set it up to heat in the morning. They eat bowls throughout the day to keep them going. By late afternoon there was only a small bit of sauce left, which our Aussie dog Ginger devoured mixed with her kibble. Everyone was happy. The key to a good gumbo is the brown roux, a mix of flour and butter that you cook slowly until it turns the color of caramel. There is no rushing the roux - just stir, watch and smell the transformation. The roux will smell like toasted nuts and when you add the chopped celery, onion, and peppers to the pot, the aromas say "gumbo". The recipe makes a large pot, enough for 8-10 people. This soup is best made ahead and reheated - it always tastes better. Great for a football game, Halloween party, or celebrating our first rain of the season.